Ornamental, often textured facades – not seen in significant numbers since the floridly decorative ones on Art Nouveau buildings – have made a comeback in recent years. 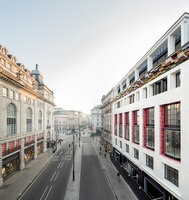 Architects who have helped spearhead this development include London-based FAT, whose Blue House is fronted by a cartoon-like, powder blue silhouette of a house, and Squire & Partners, which has just completed a house in Mayfair whose facade bristles with 4,000, folded aluminium leaves in bronze. Often bespoke, today’s ornamental facades make a virtue of craftsmanship. And usually made of a single material, they tend to be monolithic yet avoid being dull since they’re unique and eccentric. 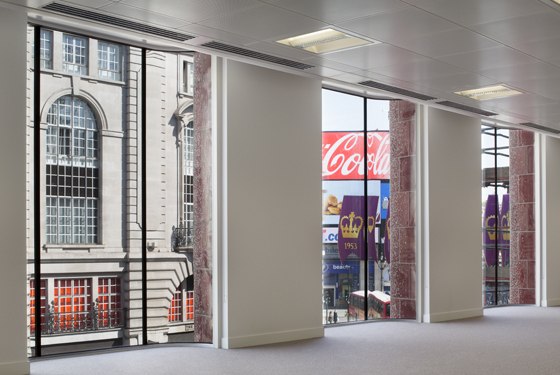 One tributary of the trend is a growing number of buildings with large-scale, matt or glossy ceramic facades. 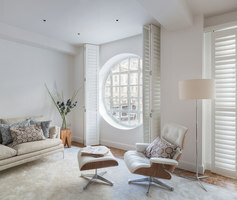 These inevitably recall such elaborately decorated Art Nouveau buildings as Antoni Gaudí’s Casa Batlló with its iridescent roof, Paris’s Ceramic Hotel with its glazed earthenware facade, courtesy of ceramicist Alexandre Bigot, and Villa Marie-Mirande in Brussels, which is cloaked with hand-made tiles provided by ceramicist Guillaume Janssens. Centuries older are the dazzling, polychrome mosques of Isfahan in Iran, the earliest dating from around the 8th century. 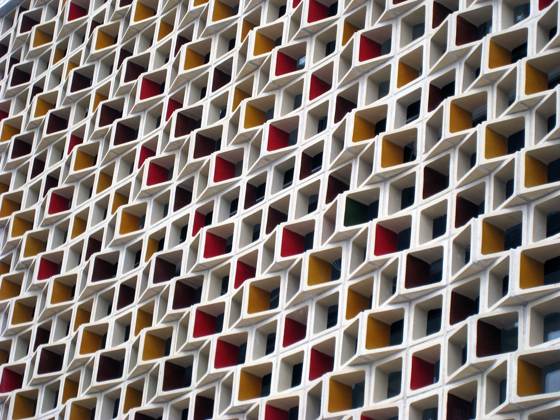 Some believe ceramic facades went out of fashion in the early 20th-century because purist modernist architects were besotted with glass, concrete and steel. However, several mid-century architects who favoured an organic, sculptural aesthetic rediscovered ceramic facades – Jørn Utzon’s Sydney Opera House (1957) and Alvar Aalto’s Seinajoki Town Hall in Finland (1962-65) are both clad in hundreds of tiles. 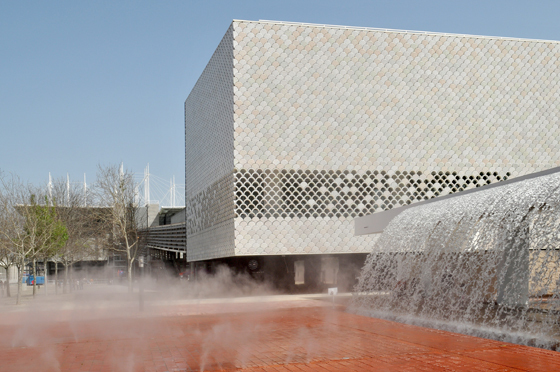 Today’s architects who create ceramic facades are aware of these traditions. 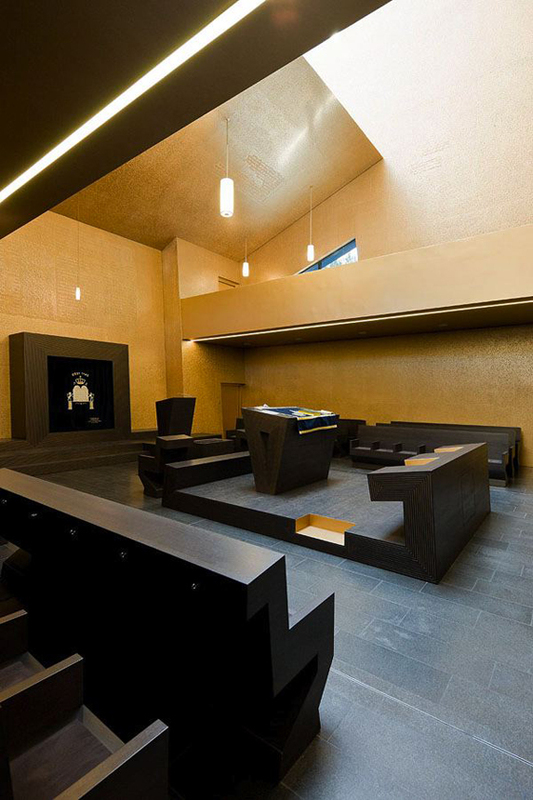 But their versions differ from Art Nouveau buildings in that they marry the potentially decorative quality of ceramic tiles with a contemporary, relatively minimalist aesthetic and boldly sculptural, abstract forms. 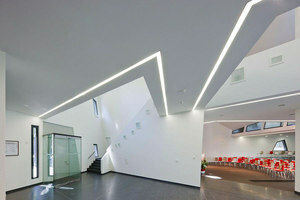 And architects today often refer to local context. 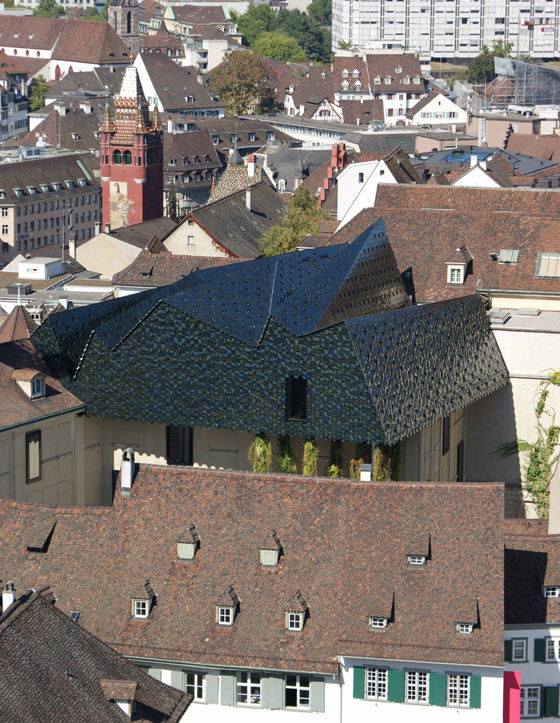 Take Herzog & de Meuron’s renovated Museum der Kulturen in Basel of 2011. Now housing ethnographic artefacts, it was originally designed in 1849 by Melchior Berri, with an extension added by architects Vischer & Söhne in 1917. By the Noughties, it boasted 30,000 objects, and more space was needed. 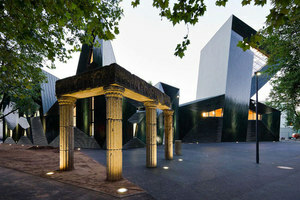 Enter Herzog & de Meuron, which crowned it with a new, double-height gallery floor whose cantilevered roof is clad in a striking, virtually windowless carapace of hexagonal, ceramic tiles in a stormy grey colour reminiscent of the inside of mussel shells. 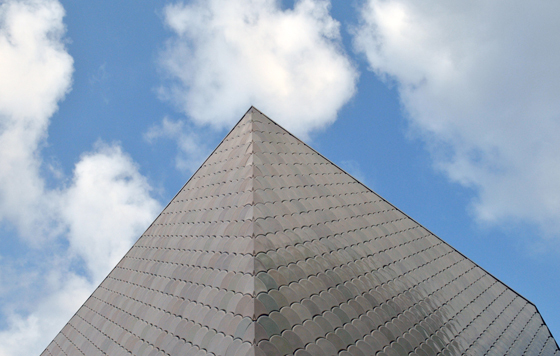 Its convex, concave and flat tiles – supplied by German architectural ceramics specialist Agrob Buchtal – create a 3D surface, and so enhance the sculptural quality of the roof. 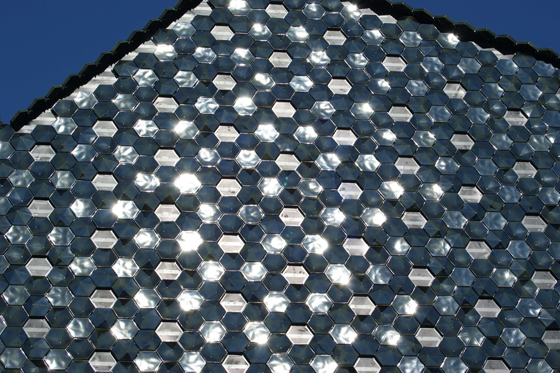 The tiles also animate the roof’s surface when they sparkle in sunlight. What’s more, the roof’s jagged, asymmetric silhouette evokes a Gothic fairytale but its form isn’t arbitrary or merely fanciful: it’s designed to echo the roofs of the surrounding medieval buildings. 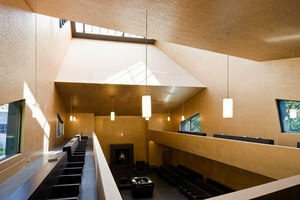 Ceramic tiles form a similarly homogeneous skin around Basel-based Manuel Herz Architects’ Jewish Community Centre in Mainz, Germany, which incorporates a synagogue. In medieval times, Mainz had considerable intellectual influence on European Judaism, though the city’s Jewish community has also been severely persecuted; in 1938, the Nazis destroyed its synagogue. In recent decades, the Jewish population has grown, necessitating new facilities. 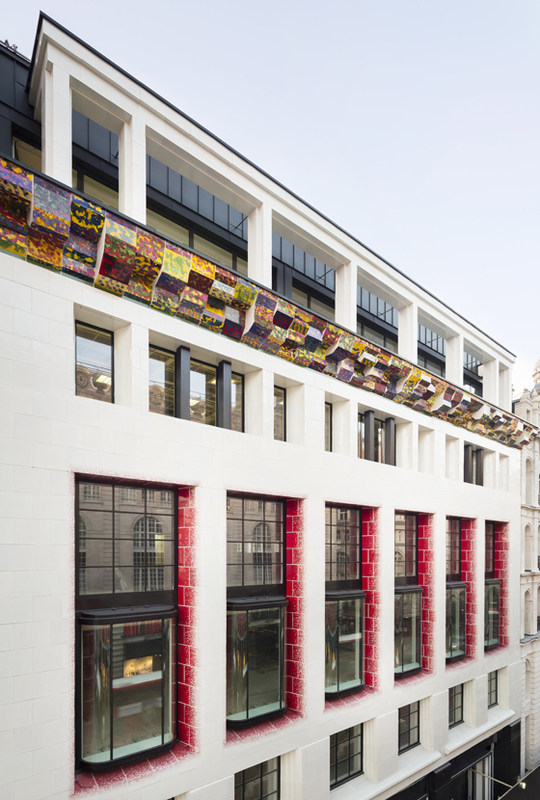 One Eagle Place, a new project in Piccadilly, London – which involved the refurbishment of old buildings and construction of a new facade made mainly of white faience blocks (glazed earthenware) – is closer in spirit to the sensual style of Art Nouveau architecture. 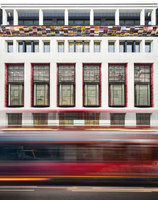 Designed by Eric Parry Architects, its facade features an idiosyncratic cornice created by Turner Prize-winning artist Richard Deacon, whose colourful, abstract patterns were created with ceramic transfers or decals normally used to decorate plates (sourced in Stoke-on-Trent, the UK’s ceramics centre). The gleaming facade and Deacon’s jazzy patterns are intended to reflect the ‘polychromy and artifice of Piccadilly Circus’. ‘My knowledge of Iranian, Art Nouveau and Vienna Secessionist architecture was bubbling in the background,’ says Eric Parry. 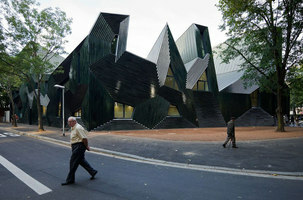 ‘But more importantly, I’m against the shallow epidermis of much contemporary architecture. 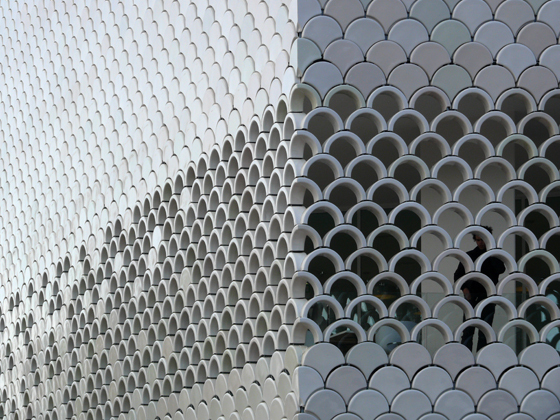 Ceramic facades have depth, they’re voluptuous.’ He also describes them as ‘haptic’ (meaning tactile). A passion for ceramics and craftsmanship is central to the workshop of Toni Cumella, a ceramicist who, between 1989 and 1992, helped restore Gaudi’s Casa Battló and Parc Güell. 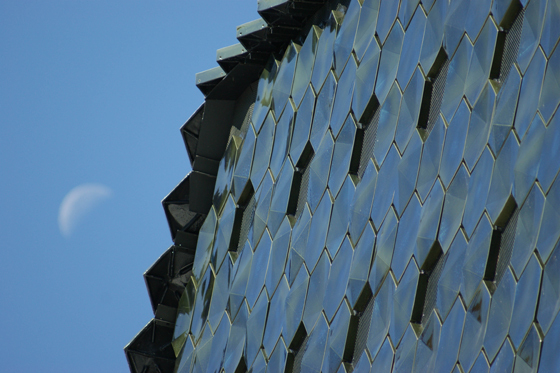 Called Ceràmica Cumella and based near Barcelona, the workshop has also collaborated on many cutting-edge architectural projects, notably architects Enric Miralles and Benedetta Tagliabue’s spectacular Santa Caterina food market of 2005 whose undulating roof is carpeted with 325,000 tiles. 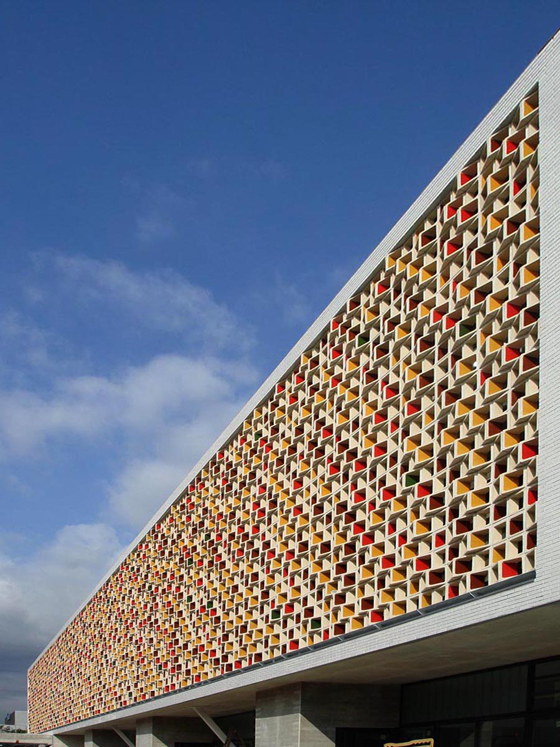 And Cumella has provided the ceramic lattice on two walls enveloping the CEIP primary school at Cornellà de Llobregat, near Barcelona, of 2010, designed by Mestura Arquitectes. 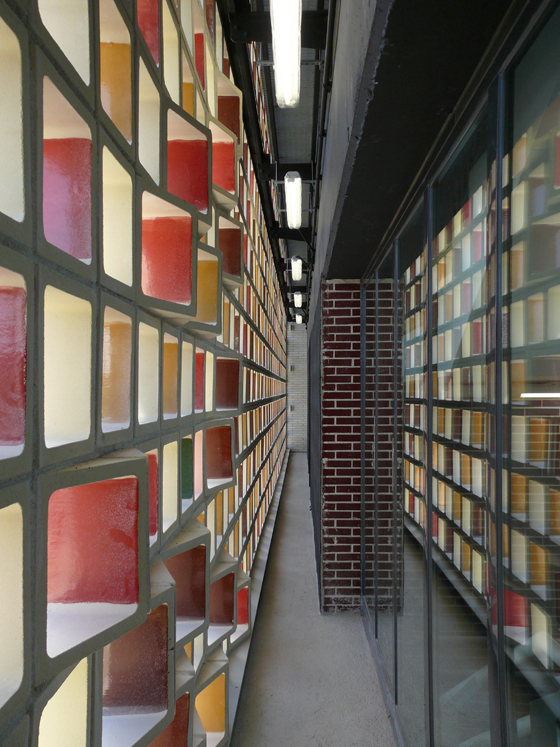 Its ceramic components have angular facets, which, facing one direction, are coated with a warm, red glaze and, facing the opposite way, with a cool, green glaze – and provide a glass box encasing the building’s interior with shade. 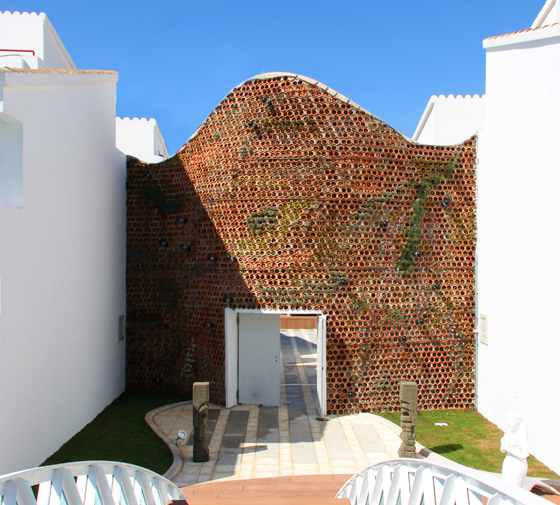 A more unusual application of ceramic elements can be found at Spain’s Ushuaïa Ibiza hotel. 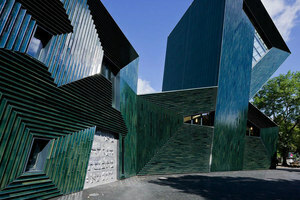 This features a snaking ceramic wall designed to soundproof the hotel’s restaurant, which adjoins its open-air nightclub. 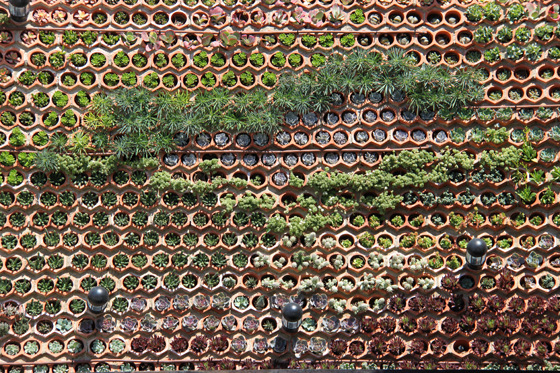 Fashioned out of ready-made elements – ceramic wine racks – the wall doubles as a vertical garden studded with indigenous succulents. According to its creator, Urbanarbolismo, which says the ceramic structure nods to the flowerpots of Andalucia’s patios, the wall is low-maintenance and sustainable since its plants thrive in little soil, withstand strong heat and need only be watered once a month in winter and once a week in summer. 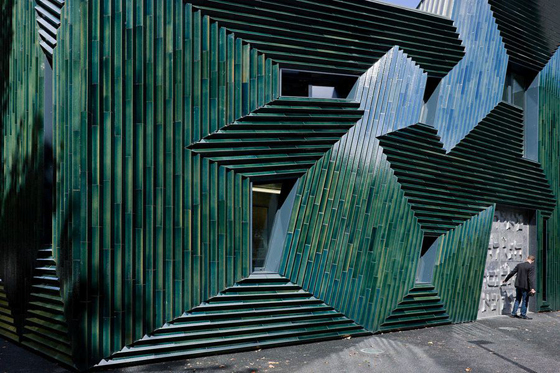 Indeed, ceramic cladding also appeals for being sustainable. Spanish ceramic tile manufacturers, for example, now recycle many waste products and so use less raw materials, such as water and clay. And these days, single-firing ceramics (more environmentally friendly than double-firing them) is more common. 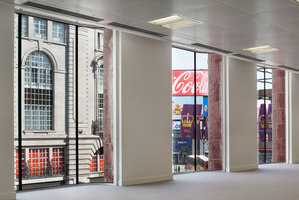 The resulting products might be decorative but there’s nothing superficial about ceramics used to front buildings. If it’s one thing they’re not, it’s just a facade.